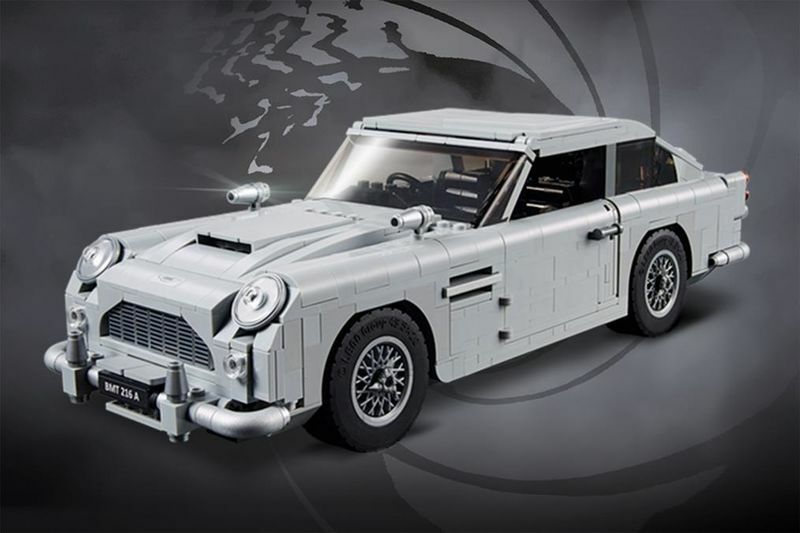 James Bond’s seminal Aston Martin DB5, featured in the film Goldfinger, is the latest car to get the LEGO treatment. LEGO has done it yet again. About a month ago the LEGO Technic Chiron was revealed, now LEGO pays homage to James Bond with one-eighth scale Goldfinger-inspired Aston Martin DB5; front machine guns and bullet-proof rear shield also feature. The LEGO Creator Expert James Bond Aston Martin DB5, to give the model its full name, features many of the Goldfinger car’s gadget hallmarks. Once built, you’ll find a working ejector seat, revolving number plates, ‘tyre scythes’ that emerge from the wheels’ centre nuts, and a bullet-proof screen that rises from behind the rear windscreen. The LEGO DB5’s bonnet, boot and doors open, while other details include a radar screen, wing-mounted machine guns and a hidden telephone. The model is finished in the same ‘Silver Birch’ colour as Bond’s Aston, complete with lacquered front and rear bumpers and wire-wheel rim inserts. It’s billed as being an “authentic replica” with the same “smooth curves and sleek edges” as the original car. LEGO has a history of linking up with high-end car makers. The recently-launched LEGO Technic Chiron, for example, features a moving 16-cylinder engine and eight-speed gearbox, while the Porsche 911 GT3 RS offers building fans similar levels of complexity. To celebrate the model’s launch, LEGO is offering fans the chance to win a trip to the 007 Elements exhibition in Solden, Austria. Located 3,000 metres above sea level in a Bond villain-style lair built at the top of a snow-covered mountain, the 007 Elements show features a range of “high-tech, interactive galleries” evoking the atmosphere of a Bond film, no one wants to miss out on that trip of a lifetime! The LEGO Creator Expert James Bond Aston Martin DB5 is on sale now in LEGO stores and online, priced at around R6000. Bugatti Chiron Lego Kit Launches... With 3,599 Parts! Aston Martin's First Silent, Zero-emission Vehicle!